As digital transformation disrupts the workplace, one factor more than any other will determine which companies turn digital to their advantage. That critical element is people: the talented employees who are able to use existing digital technologies and adapt to evolving methods and new approaches. Without these employees, companies will struggle to benefit as they should from the latest advances—everything from Industry 4.0 and robots to artificial intelligence, data science, virtual reality, and new digital business models. The technologies themselves will be evolving and relatively easy to exchange, but the workers capable of using them will be scarce. In fact, we expect a severe shortfall in digital talent around the world by 2020, when, according to a Gartner study, 30% of tech jobs will be unfilled owing to digital talent shortfalls. According to recent BCG research, even today, the biggest perceived technology challenge is not data security or the need to invest but a lack of qualified employees. Digitally talented people are already so highly in demand that many large, traditional companies must reinvent themselves to attract them. Our research shows that only 25% of the digitally skilled people found in online recruiting databases today are working at companies with 10,000 or more employees. Companies should respond to this challenge by building new pools of skilled digital employees. To do so, they must understand who these potential employees are, where they can be found, and how they can be attracted and retained. Companies also need to know what kinds of talent can be nurtured within the existing employee base; digital talent must come not only from the acquisition of new personnel for specific jobs but also from the development of digital skills in existing roles. Lastly, companies must bring the entire organization along on the journey, creating a true digital culture and inculcating in their employees a deep understanding of the company’s digital imperatives and a mastery of select skills across all functions. If the growth in digital talent outpaces the ability of the rest of the workforce to keep up, the company as a whole will be left behind. To build and retain a strong pool of digital talent, companies must answer four important questions. They need to understand who is available on the market and who makes up the core of digital talent already in place across the business, and they need to identify the new digital job profiles and the number of digital employees required in the near future. They must next understand where to find the required employees over the medium and long term—and how to recruit and retain them. Finally, they need to understand what digital skills need to be nurtured and developed among their existing workers. Without skilled staff, there can be no digital transformation. For any digital people strategy, the first step is defining what “digital talent” means. Until the company fully understands the digital profiles, or job functions, available in the market and within the company, there can be no clear way to determine how many digital employees—and in what profiles—it must recruit, develop, and retain. The digital venture strategist provides leadership across any stage of a digital business model, whether the strategist is sitting in a digital spinoff, digital department, strategic function, or elsewhere. The marketing automation specialist supports digital marketing using artificial-intelligence bots to interact with customers online. The user interface (UI) and user experience (UE) designers, part of the digital development impact area, focus on interfaces and experiences for users of software applications. The data scientist, part of the advanced analytics team, analyzes and interprets data and is capable of, for instance, finding hidden connections or interesting patterns in data. The robotics and automation engineer builds, configures, and tests robots, primarily for manufacturing purposes. The scrum master is proficient with the latest ways of managing development projects and facilitating agile ways of working. For each profile, our analysis identifies core skill sets, the best locations in which to find the skills, and the best-in-class employers, along with subprofiles (for example, “robotics and automation engineer” is an umbrella term that includes the subprofiles perception engineer, robotics software engineer, test and automation controls engineer, and human-robot interaction architect, among others). One international manufacturer with over 100,000 employees used these profiles to analyze its current and expected digital talent base and understand its need for—and supply of—digital talent over the medium term. It first estimated what each planned digital initiative would require in terms of the 20 profiles. It then refined the results through workshops with key functional experts, an internal analysis of the company and its functional strategies, and a careful look at external trends. With the final estimates in hand, the company analyzed internal data about the digital talent available in house—along with historical attrition rates—to create a model that forecasted the demand, supply, and resulting gap for each profile. As a result of this extensive planning effort, the company found—to its surprise—that it would need to triple its existing digital talent base and train or retrain the majority of its employees in order to execute its digital agenda and stay competitive. We believe a similar strategic planning effort could help other companies understand their digital talent needs—and provide valuable insights as they embark on the recruitment and development effort to fill the inevitable gaps. (See Exhibit 2 for a workforce planning example.) The planning effort can employ several scenarios based on various assumptions about the future demand for, and supply of, digital talent. And the scenarios can be updated as assumptions are confirmed or refuted. As companies begin their recruiting efforts, they need to know not only whom they are looking for but also where to look. This is particularly true for organizations with a global footprint. These organizations must identify cities that have a good supply of digital talent—cities where the company will seem attractive to native residents and where the company will be able to build up its digital resources over the medium to long term. Organizations should take each of the six dimensions into consideration when determining the best location. Is the company looking for several hundred highly skilled programmers at a reasonable cost? Is it looking to attract the best talent in digital innovation? Is it building new digital business models? Factors such as the number of startups, the presence of global tech players with whom the company will compete for talent, the overall wage level, and the number of relevant patents generated in the candidate city should all be considered. The company should weight each factor according to the types of digital talent it seeks. We note that this analysis is usually made more complex by a company’s existing global presence, which has clear implications for the choice of a new entity’s location. The nature of a company’s current presence makes a difference, because there are several possible ways to build a digital talent base, including greenfield investment, cooperation with a local university, startup acquisition, and participation in an incubation hub. In a large-scale digital talent search, of course, there is no single best answer to the “where” question. For many traditional companies, it may be too frustrating and cost-intensive to search for talent in tier 1 locations such as Silicon Valley. Instead, they might have better luck in tier 2 cities. A structured analysis of the company’s needs, combined with a model of its current and future locations, can yield valuable insights. Once the company has a detailed understanding of the “who” and the “where,” it needs to tackle the “how”—how to recruit and select the right digital talent in an era when high demand for such talent and low-cost access to information put the power in the hands of the job candidates. Step into their shoes. On the basis of our analysis of more than 100 recruiting methods and interviews with more than 50 top recruiters, we have identified several best practices in the search for scarce digital resources. Most important of these, we believe, is understanding how digital employees think. Although the 20 digital profiles we found in our research represent very different backgrounds and skill sets—from experienced coders with a classic IT background to Generation Y and Z self-taught entrepreneurs, freelancers, and conventional top-university neophytes—they seem to share a digital mindset. The employees with this mindset are entrepreneurial and inclined to data-driven decision making. They focus on user-centric product and service development and are passionate about creating and building. They are experienced in multidisciplinary teams and show a strong tendency toward collaborative and agile ways of working. When it comes to the work environment, digital employees are more concerned about their product portfolio—the projects and products they build—than about prestigious titles or linear career paths. They want to be surrounded by inspiring peers and thought leaders in their field of expertise. In addition, they are more open than traditional employees to unconventional forms of compensation, such as stock options and shares in intellectual property. Many also want to make a meaningful, positive impact on the world, and most would like to define their own work-life balance. In short, digital employees make up a specific recruiting pool that requires new ways of attracting and selecting talent. Install tech-savvy recruiters. More than 90% of digital employees today use online tools and communities in their job search. And they find new jobs in an average of less than two weeks. To compete for these individuals, traditional recruiting practices are not enough. (See Decoding Global Talent: 200,000 Survey Responses on Global Mobility and Employment Preferences, BCG report, October 2014.) Companies today need recruiting staff with social media and online networking skills, HR software capabilities, and digital knowledge. Only programmers can recruit programmers; recruiters must speak the language of their candidates. The recruiting team at one consumer goods company, for example, uses advanced machine learning platforms to write job postings. These platforms can instantly predict the performance of a recruiting post—by comparing it to more than 70 million other posts—and provide options for improving it. Such posting makeovers lead not only to faster hiring but also to broader reach and better fit. Look to new talent channels. Most organizations have already developed some form of strategy for online recruiting; however, their plans often fall short. One reason is that the digital talent they seek might be using only group-specific recruiting platforms, such as AngelList for entrepreneurs, GitHub and Stack Overflow for engineers, Dribbble and Behance for designers, or Kaggle for data scientists. Recent technophile graduates may be using platforms such as The Muse or apps such as Debut in their job hunts. To reach these people, companies need to use the appropriate platforms. Other channels also serve well. Google, for instance, uses internal referrals as a principal recruiting channel. It has also turned to developing countries in its search for software engineering talent, collaborating with Andela, a global engineering organization that recruits job candidates from the top 1% of software development talent in Africa, shapes them into technical leaders, and then connects them with Google USA and other global technology companies. Target their interests. Recruiters can also reach a broader pool of digital employees by addressing their interests directly. They can connect with digital talent in person, for example, by participating in targeted informal events such as CreativeMornings, a breakfast lecture series for the digital community that takes place in cities around the world. These events allow creative people of all types to mingle, network, and share insights before the workday begins. Other methods include sponsorship of virtual competitions through online communities such as HackerRank or of live events such as hackathons, or codathons, which bring together large groups of programmers—typically students—to build websites, mobile apps, and other projects in a relatively short amount of time. In view of the detailed “who,” “where,” “how,” and “what” requirements that we have described, along with the need to act quickly, the company decided to rely on a strategic partnership to help build and operate the digital accelerator until the company develops the capabilities to sustainably operate the accelerator on its own. Working with a strategic partner made it possible for the company to significantly shorten the time needed to establish the accelerator, as well as to support teams across many functions and to avoid most of the traps and early mistakes that can be inherent in such a venture. Digitalize and personalize. Once the right target groups have been reached, it’s the selection and recruiting process that will distinguish the successful company from its competitors. Most traditional companies still need to speed up and automate this process—to become fully digital. Throughout the recruiting process, companies should try to maintain a personal touch, finding a way to balance digital methods and personal appreciation. Some companies are using prerecorded video interviews to ask customized questions and gather responses from job candidates early in the screening period, while others are reaching out more proactively to keep candidates engaged until the final decision is made. Retain the new talent. With so many new digital employees in their ranks, companies need to create an environment in which these individuals will want to stay for the long term. They can do so by, for example, providing ongoing learning opportunities and interesting career paths. Google and Procter & Gamble found a way some years ago to move talent around—not only internally but also between the two organizations. This partnership came about as P&G sought to do a better job of marketing itself online and Google was looking to big consumer goods companies for more advertising money. Companies can also keep talented employees in the fold with programs and policies that show personal appreciation, create a positive work-life balance, and cultivate a collaborative, flexible workplace. Although recruiting a new pool of digital talent with specific profiles is essential, the enormity of the demand for digitally savvy employees means that not everyone can be brought in from outside the business. Nor would a company want to turn over the majority of its workforce. Instead, it is today’s marketing, finance, manufacturing, HR, and other staff who make up the core of the workforce for the digital journey. To understand how much of the demand can be met internally, companies must first understand what digital skills are needed by which of their current functions and job profiles. When these needs are fully defined, companies can then create and institute a digital enablement program to train employees to the appropriate levels. What digital skills, at what level? Because “digital” is a vast domain covering many types of technologies and activities, companies rarely have a comprehensive list of the capabilities they need or a clear understanding of which capabilities each internal role requires. The six areas of impact, introduced in Exhibit 1, can help here. Within these areas, we have identified more than 100 digital skills, such as the ability to understand digital business models, the ability to design cutting-edge digital products, and the ability to use agile working methods outside of IT. And no employee requires more than a few of these skills; just three to five are typically enough for most of today’s functions, depending on the industry, the size of the company, the level of specialization in the function, and other company-specific characteristics. When setting up a digital enablement program, it is essential to understand the level and number of the individual skills required for each role. A comprehensive digital-skill matrix can help. (See Exhibit 4 for an example.) To develop this matrix, an organization looks at its corporate functions and aligns them along the list of digital skills; then, using a tailored agile “sprint,” or iterative, approach, HR and the relevant function work together to create a detailed, company-specific version. The matrix shows the profile group (finance, for example), the subprofiles within the group (such as controllers, accountants, and treasurers), the top digital skills each subprofile needs, and the maximum skill levels that could be required. The matrix also includes the number of full-time employees in each profile, which allows the company to see how many employees will be needed and what kind of skill building each function will require. We recommend training a group of employees in no more than five digital skills at a time. Attempting to do more is difficult, particularly as part of a firm-wide transformation. To determine which of the more than 100 skills are the most important for a given function, the company should hold digital sprint workshops and discussions with representatives of each pertinent subprofile. Institute digital enablement. With the digital-skill matrix in hand, HR can begin to develop the company’s overall digital enablement journey. It will want to move quickly, as the digital products, channels, business models, analytics, and working methods are already in place or are just around the corner. Of the three skill levels, basic awareness is the easiest to build and the most relevant to large groups of employees. Awareness can be developed using online tools, training materials from vendors, and even publicly available resources. For the intermediate and advanced levels, skill building naturally requires more time and resources. Exactly how much more depends primarily on the skills being considered within each function; however, a mix of training, experience-based learning, practice, and even job rotation are typically required. 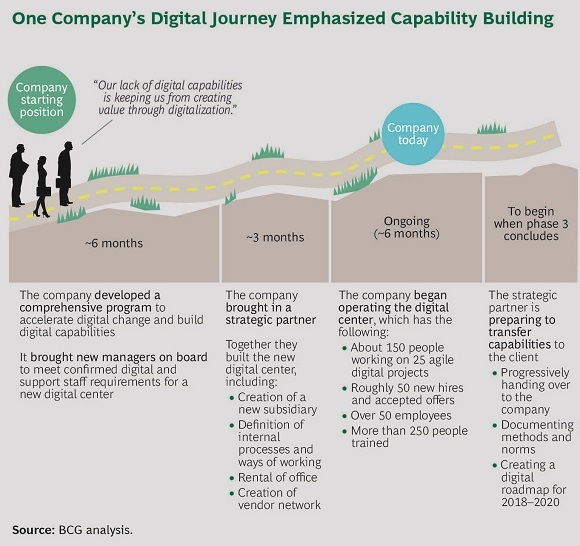 Digital enablement is a long journey; it can typically take years, depending on the starting point, the size of the business, and the resources applied. Yet the effort pays off from the very beginning, as employees across functions can use their new skills, even on the initial levels, immediately. It does little good to hire an artificial-intelligence specialist or a team of data analysts if the rest of the organization has no idea why these new employees have arrived. And digital talent will have little inclination to join or stay with an organization in which they do not feel at home. The most important step in the long-term hiring and retention effort is therefore to use the new talent to help create a true digital culture, one that permeates the organization, brings the entire workforce on the digital learning journey, and inculcates a deep understanding of the company’s digital imperatives. In the short term, traditional organizations may be able to incorporate digital talent into a loose satellite structure, but they will quickly find that they need to make a significant cultural shift in the broader company. Digitalization cannot remain a closed-shop exercise; it must reach far beyond the accelerator model if it is to pull the entire organization along and be sustainable. To create a truly digital culture, the organization needs to introduce and adapt to new forms of cooperation, implementing more project-based work and running these projects in a more flexible way. It must introduce new working methods such as agile and user-centric product design, along with more experimentation and creativity, fewer fixed rules, and more tolerance for risk taking. Digitally savvy employees tend to be fast learners who crave responsibility and impact, but they will make mistakes; a culture that accepts failure is essential. The new culture should also extend to the workspace, utilizing progressive office design to attract talent and foster innovation. We usually associate venture rooms and open workspaces with startups and the tech industry, but companies such as Telekom Deutschland and Lufthansa are already using them.